Here’s another postcard of the Menton border crossing and that big white triangle in the cliff face that we saw in the last post – Passports Please! This time we have only one car, a pre-war Rolls Royce Phantom II . The owner sits inside while the chauffeur stands outside waiting for the formalities of the paperwork to be completed. Dear Joyce, I guess you are wondering who is writing to you. Well, it is Betty H. and at the moment I am somewhere on the Med. at a spot called Bandol. Just the job too! I have been at Nice for a week (all on my UK leave). Lovely weather and scenery. Don’t want to go back to Paris. Betty. I like too that she’s added O.A.S. at the top with a small cheeky question mark beneath. Service men and women On Active Service were allowed free postage from Field Post Offices. Betty isn’t exactly OAS as she’s on leave, but it got back to London OK anyway. I don’t know why she sent this particular card as Menton is east of Nice and Bandol quite a way west. Something else we’ll never know. So we have a pre-war car in a postcard posted on a vacation just after the Second World War. 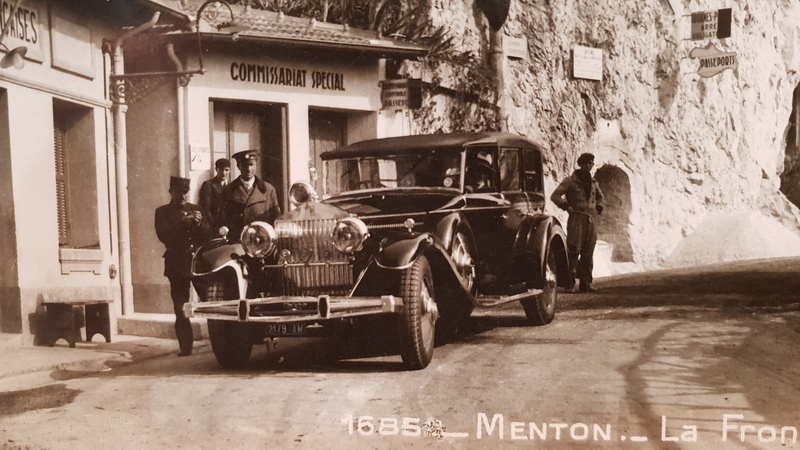 Only a year before Betty posted it Menton had been under German control and earlier under Italian occupation having been captured by the Italians during the Battle of the Alps (10–25 June 1940). With peace and borders restored (well at least this one) the scene was set for Passports Please! with its happy holidaymakers in the sixties queuing up in the sun to cross the border and the lady photographing her husband with the big white triangle in the background. And now? Well, sadly, last year, despite both counties being inside the EU and signatories to the Schengen agreement, this border crossing again made the news as France stopped refugees entering from Italy here. I feel strangely drawn to that triangle. Must go there next time we’re in France.